You Want Need Must Have Shower Curtain! Some people say that the paperback is going out of style… but I disagree. Most of my sales are paperbacks. You can save $10 by ordering the eBook (even more if you are ordering online, because of the shipping and handling), but in the local market… where people buy the most, you can pick up one of my books for $17 or $18 at a local bookstore, and if you track me down, you can easily get it signed. By “easily” I mean, if you take me out to coffee, or, if your mom knows me or something, because let’s face it, I’m not famous. Not being famous, I’m thinking, none of you are going to want to purchase my overpriced crap on CafePress. But then it occurred to me, that maybe I’m wrong. What if some of you are rich and stuff? You may feel that you really can’t live without a $224.99 Queen Sized “Things That Go Bump in My Head” Duvet, and if so, who am I to deprive you? Indeed, who am I to keep you from sleeping nightly under a totally awesome $225 blankie with all my books on it? I can’t make that decision for you, so I simply MUST offer you that blanket. Oh, did I mention the $60 Shower Curtain? In addition to the shower curtain, which you want, need, and have to have, there are also several adorable stuffed animals wearing tiny “Things That Go Bump in My Head” t-shirts that you probably can’t live without. I mean, the plain white teddy bear ONLY costs as much as one of my novels, at around $17, and, while you’re spending, there is that cute little cow with the artwork tattooed across it’s tiny chest… I know you need it. You want it. Because it’s so cute. Almost as desirable as the pajama set…. yeeeessss…. You totally WANT to spend $28 for the adorable cow (which is $10 more than a book) or $20 for the Adorable Teddy Bear – because Horror gives you nightmares, and you will not have as many nightmares when you read these scary books if you have the stuffed animals. You know what else you need? You need a Snuggie. Either the Snuggie, or the Pajamas, for only about $50. In the middle of the night, when the books begin to frighten you, you can sleep soundly in an overpr…er…uhm…. $44 “Blanket Cover” (that is generic code for “Snuggie”) – this Bad Assed Snuggie also looks kind of like a creepy Gregorian Monk robe, so if you are really, really into “Warmth” you can toss it in a vat of brown Rit dye at some point and dress up as Sera in her late Medieval period. Although, frankly… I have to admit that the pajamas are cooler.I’m guessing you guys can’t really afford all this stuff, and would rather have the books anyway…. but that’s just a guess. After all, for all I know, you really need the mug…. 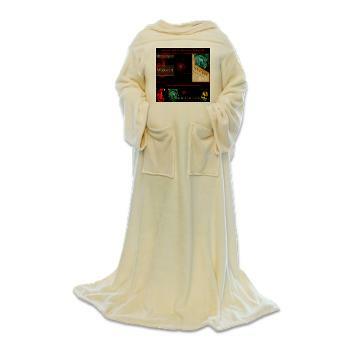 or want the fabulous Medieval Snuggie Robe… Everyone wants a Medieval Snuggie Robe. ~ by Sumiko Saulson on May 12, 2012.